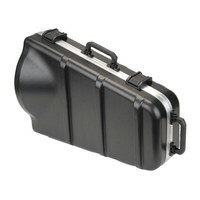 The SKB Universal Euphonium case is made from durable yet lightweight ABS molded plastic and will accommodate a variety of upright bell three or four valve euphoniums from leading manufacturers. This entry was posted in SKB and tagged Woodwind-Brass-Strings. Bookmark the permalink.